How can tweeting trees help keep a forest vital? A team of 20 Wageningen researchers is investigating the resilience of a forest. “Today I transported 114.1 litres of water. Time to stop my sap flow now, at 13.49” This was one of the daily tweets from a giant poplar hung about with measuring equipment, on the Wageningen campus. “The air is quite dry today, 17 percent drier than yesterday. I must take good care of my stomata, otherwise I’ll lose too much fluid,” reads another message. The popular poplar has been tweeting since May 2017, a result of collaboration between forest ecologist Ute Sass-Klaassen and the inventors of the system at the University of Ghent. The tree already has 4400 followers, who get daily updates on the way the trunk swells and shrinks, the amount of water that is evaporated and the tree’s daily growth. Over recent months, the tree has reported on how it got through the dry summer of 2018. What goes on inside a tree? An adult tree pumps about 200 litres of water a day from the roots to the leaves, where it evaporates. In times of drought, trees close their stomata so that less water evaporates. But then they cannot absorb any CO2 either. Long-term drought causes growth to stop and – in the worst case – the tree to dry out. A tree’s growth and the movement of the water cannot be seen with the naked eye, but thanks to the sensors in this tree, they are visible now. 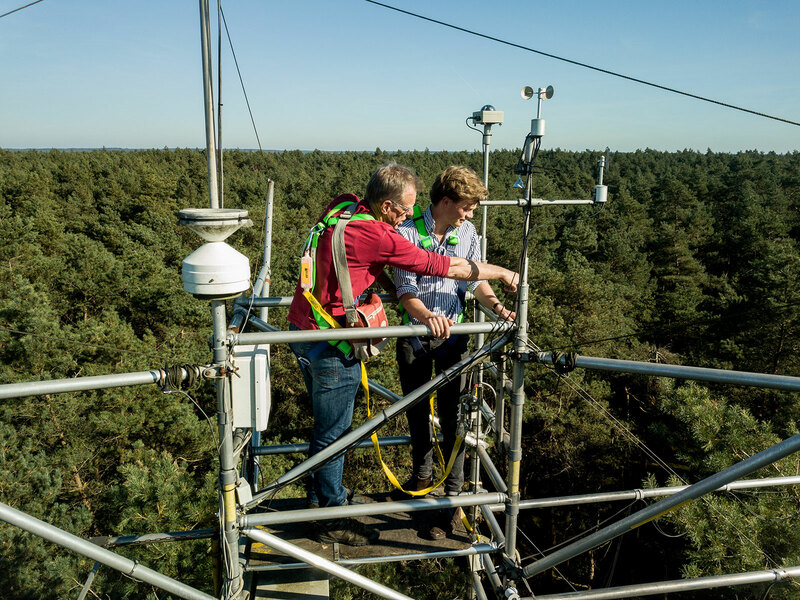 Researchers climb up the flux tower in the Loobos area of the Veluwe plateau. A flux tower is used to measure the CO2-balance in the forest. The Wageningen poplar is part of a growing network of tweeting trees. 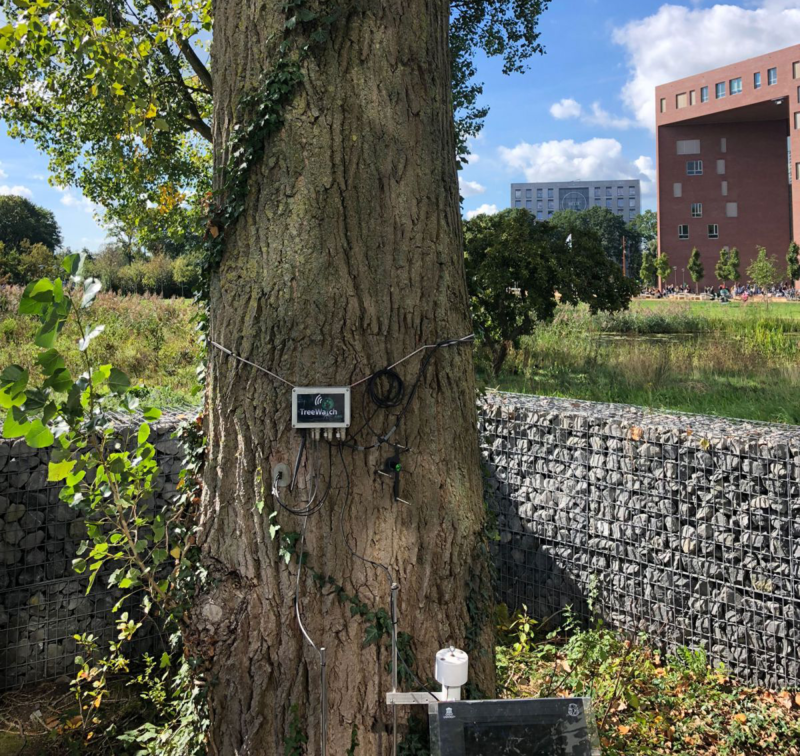 In the Netherlands, researcher Gert-Jan Nabuurs has equipped a hundred trees with apparatus that records their water transport and growth continuously. Trees are important to our climate and the researchers are keen to know what impact extreme weather such as drought, heat and flooding has on their vitality. Such knowledge about trees’ adaptation capacity in the face of changing conditions is key to creating more resilient forests. In the Loobos forest on the Veluwe, a team of 20 researchers are studying various aspects of the forest’s resilience. In the photo: field work equipment and climbing tackle for climbing the Flux tower, and a data logger for the sap flow meters. How vital are our forests, and how well can they cope with a setback? Theoretical ecologist Geerten Hengeveld leads a team of about 20 scientists who study various aspects of the resilience of trees using a range of methods. Because individual trees have long lives and forests only change slowly, the researchers are using various methods in parallel, in the Loobos area on the Veluwe plateau in the Netherlands. Measuring equipment in the Loobos: (left) calibration gasses for fine-tuning the CO2 concentration measuring system, (centre) a field computer, (right) a fuel cell generator. The CO2-balance balance in the forest is measured by Bart Kruijt and other researchers using a flux tower. Within the project, these data are linked with satellite images – collected by colleagues Gerbert Roerink and Jan Verbesselt – that produce less detailed but more frequent and larger-scale series of measurements. A forest inventory is added (by Mart-Jan Schelhaas) with information about the long-term development of the forest structure and composition. 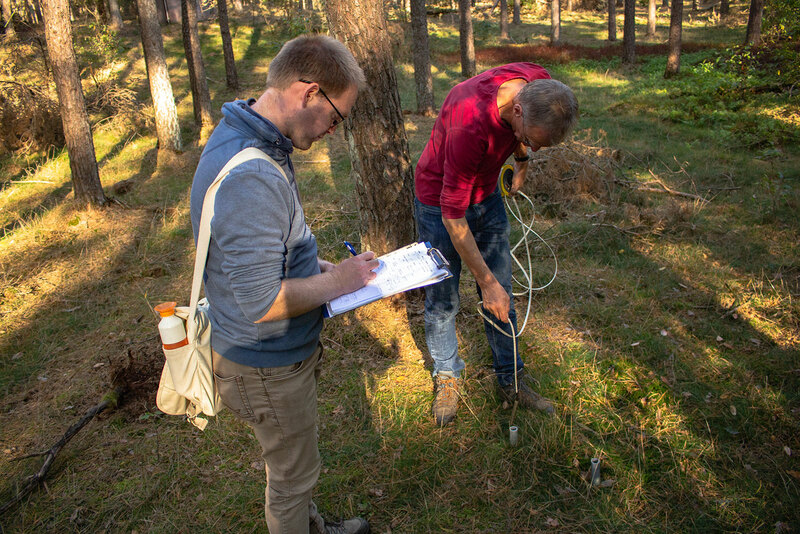 Geerten Hengeveld (left) and Bart Kruijt measure the groundwater level. What determines the resilience of a forest, exactly? It is the product of an interaction between the robustness of individual trees that have to survive difficult conditions and the ecological capacity of the forest to recover from the loss of individual trees. Worldwide, forests are exploited more and more intensively, whereas they suffer from climate change too. 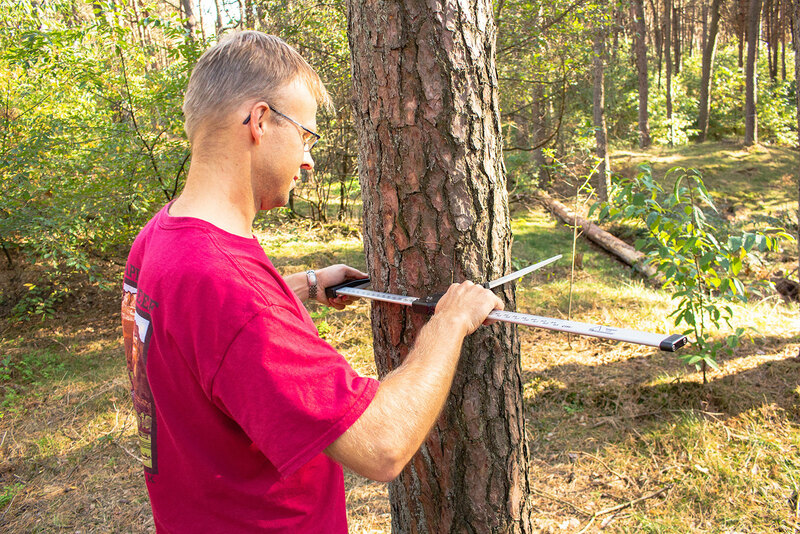 Mart-Jan Schelhaas measures the diameter at breast height (DBH) of a pine tree. Resilience can be undermined by both brief, passing threats such as a forest fire or storm and long-term problems such as drought, climate change, diseases and pests. Human intervention (tree felling, deforestation, road-building) often plays a role too, directly or indirectly. Different disturbances can reinforce each other: a weakened forest is more vulnerable to diseases. If it is over-exploited, a forest will go into decline, whereas low-level exploitation can increase its resilience through rejuvenation and adaptation to the mix of species (succession). Bart Kruijt shows intern Bas Lerink the radiation meters that are attached to the flux tower. Theoretical ecologist, researcher in Biometris business unit, Wageningen Plant Research, Wageningen University. Understanding, measuring and managing the resilience of forests worldwide. 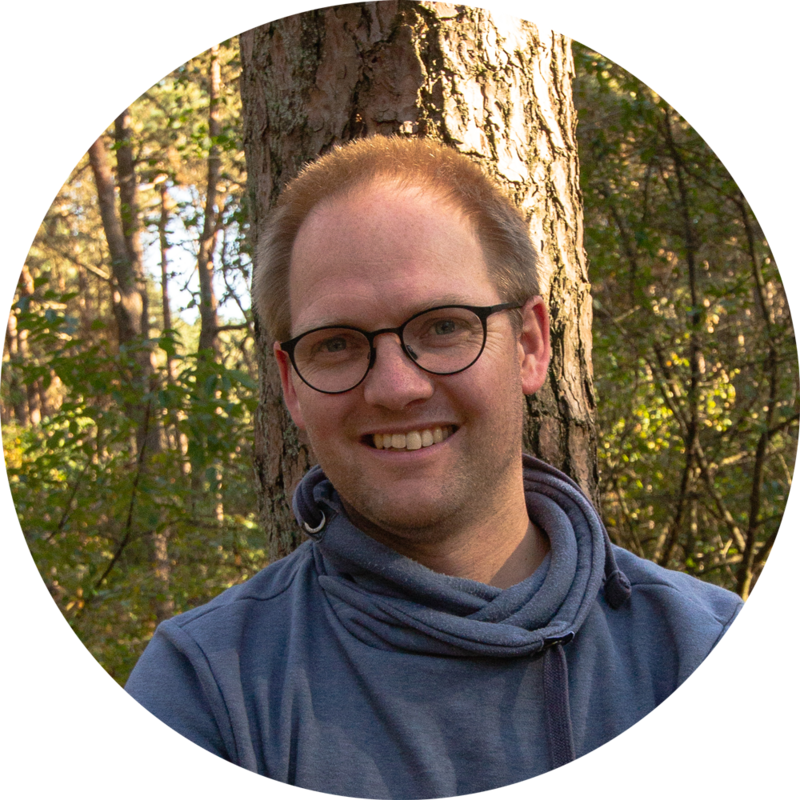 Geerten Hengeveld works on this research with WUR scientists in the fields of mathematics and statistics, forest ecology, remote sensing, theoretical ecology and the social sciences. Depending on the situation, there are opportunities for increasing a forest’s resilience through good management. Hengeveld: “Last summer was extremely dry. It was interesting to see whether our predictions about resilience match the reality of how trees behave.